Bus transport trailer truck puts you in the seat of multi-vehicle as you take charge of your own vehicle transport company. This is the best opportunity for you to drive the truck simulator with your pro driver. Drive your bus transport truck trailer through a different place like from city to the off-road area. In this cargo truck simulator, you will get multiple tasks that you need to do within time. You have played much other driving, racing, drifting and off-road mountain games but you have never played such pro driver game before. Get start your chained trailer engine, go the point and deliver the bus at their desired location on your new euro transport truck. In this off-road mountain bus transportation, you will see some impossible tracks and road but you have to deliver it on time. It’s time to prove your trucking driving with your pro driver. Put your tourist bus transport skills to the ultimate test as you get on with the city bus transporting duty of various vehicle from mega-city to off-road mountain area. Get your cargo euro truck wheel and drive in the impossible tracks. Don’t make rush in the muddy area. Be like a pro driver and racer and chase all the challenges that you will see in the tourist bus transport simulation. Travel across the vast map as an American truck driver and reach your destination. In heavy bus simulator, you will learn how to drive a heavy bus and other vehicles in twisty and curvy roads. Choose your job missions and drive across the highway to a mega city to deliver the trailer to a warehouse on destination. As a pro stunt driver, control your truck by using the break and acceleration buttons. 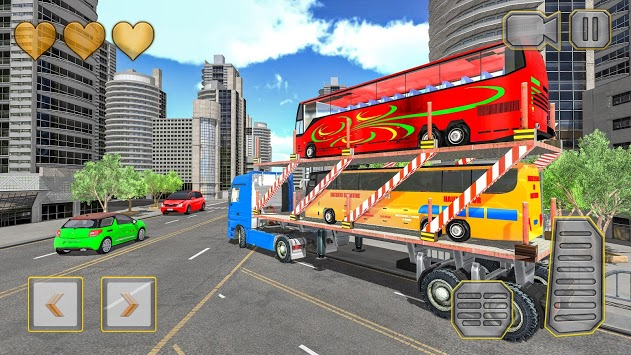 In this multistory cargo truck driver game, you get a drive around the world on a smooth and steady highway’s path with a real vehicle carrying a trailer. This endless level base game will give you an amazing experience of driving, racing and drifting. Enjoy the driving vehicle transport in this megacity environment. This euro city truck needs special skills to load the heavy buses and other luxury vehicles. 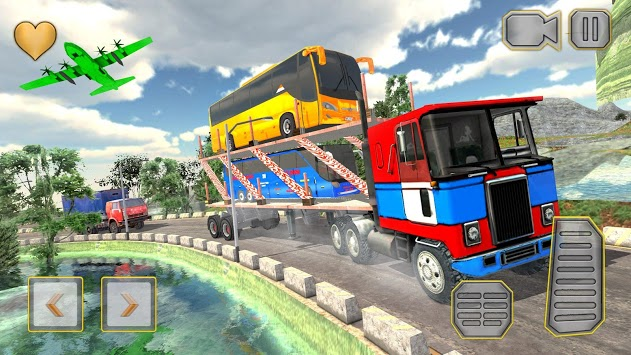 • Realistic Truck Driving Experience. • Drive across the city to the off-road area. • Lots of buses to transport.